White rhinos are perfectly designed to eat grass. With short legs, their long head reaches almost to the ground. When eating, White Rhinos swing their head from side to side. Their square mouth is the perfect shape to maximise the amount of grass they can grab in one swing. Rhinos can consume 60-80kg of food a day and up to 80 litres of water. There are five types of rhinos surviving on earth today. White Rhinos and Black Rhinos live in Africa and 3 species are found in Asia; One Horned, Javan and Sumatran. Besides being the largest, White Rhinos are also the most social. Groups of 14 or more are often seen together. Generally, these groups consist of a dominant male, females and their young. A calf will stay with their mother until another baby is born. Despite the fact that rhino skin can be up to 5cm thick, it is actually quite sensitive. Just like us, their skin is prone to sunburn, insect bites and irritation. Unlike us, they protect themselves by wallowing in the mud. A coating of mud acts as sun block, insect repellent and moisturiser. Under their skin is a dense layer of collagen. This provides padding, protecting Rhinos from knocks and scraps. This winning combination of thick skin and padding helps prevent serious injuries and complications. The use of rhino horn has a long history. The ancient Greeks believed rhino horn could purify water; the Persians thought it could detect poison; ancient Chinese nobles marked the emperor’s birthday with cups carved of rhino horn; and it became a decorative fad in Europe during the 19th and 20th centuries. 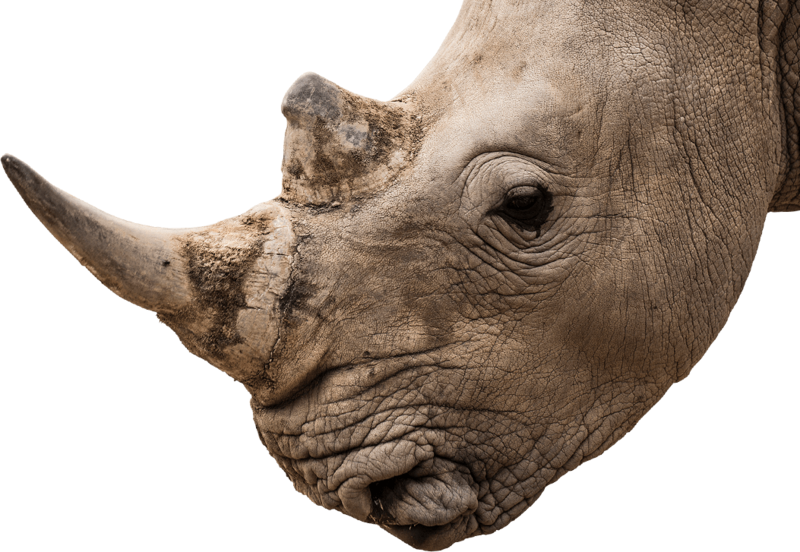 Even today, rhino horn is used in traditional medicines to treat everything from fever to cancer. There is no scientific evidence to prove that it is effective in any way, however, rhinos are killed every day for their horns. The National Zoo & Aquarium is home to 2 male Rhinos; Ubuntu and Eco and is part of a regional breeding program.